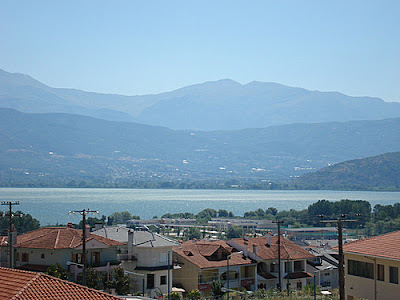 The city of Ioannina (pronounced yo-an-inaa) population 100,000 at 500m altitude,built on the bank of Lake Pamvotis, with the Pindos mountains in the background. Along with queen bees the centre also produces royal jelly,honey, pollen and propolis. 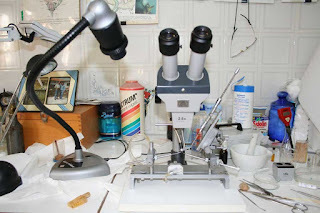 Artificial insemination equipment in the bee lab which is also used for monitoring bee health. Inside the Bee House with 317 permanently accommodated hives, for grafting, cell raising & finishing,incubation, drone and royal jelly production. The queens are freely mated from some 2000 mini nucs placed in fields surrounding the main bee house. Strong 5 frame mini nuclei with polythene between frames and lid. Cages of different races are organised and recorded before placed in boxes. 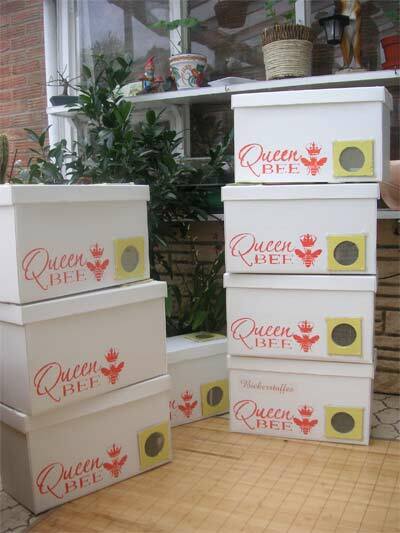 Here are a batch of the smaller travelling boxes (up to 50 queens)the larger taking 100 queen bees. The bees stay quieter in the darkness of the box which has damp sponge placed inside for humidity. Travelling boxes are placed in shaded ventilated bags which are sent in the cool of the evening to Athens airport. To see availability and to TRACK on a SMARTPHONE mobile device type this address into it or install App by clicking on queen bee picture below and then on the DOWNLOAD APP button.. The dates to the left indicate the start of the week when the Queens are sent out from the Greek bee breeding station to the UK. Following that is the number of Queens that are still available for ordering. Dates and numbers may be added to during the season.The quantities are only approximations and can change by the day during the season as events change, rationing, weather conditions, change of orders and cancellations, non payment etc. 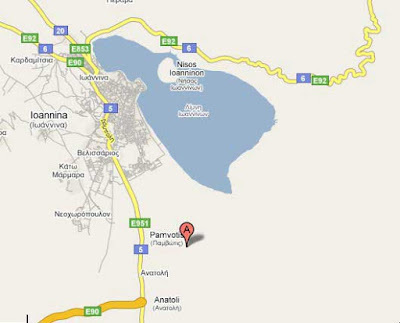 It is best to check the main web site as immediately any information is received from Greece it will be posted. beekeepers in the UK. If rationing is mentioned you may not receive any Queens. For safety keep any frames of young bees and brood over a queen excluder ( but queen right) until the Queen is with you. *To help with planning, the mobile device site will be updated once queens are posted out to customers, with the beekeepers initials and the number and race(s) of queen bees sent to that individual. delay. That Queen will still be good for at least two full seasons. UK.Follow the Parcelforce or DHL tracking number provided for a live confirmation of the shipment. NOTE. Due to the increasing number of queen bees that have been ordered and not paid for, they will now only be posted once payment has been received and cheques cleared. On no account can BICKERSTAFFS be held responsible for failures on introduction. 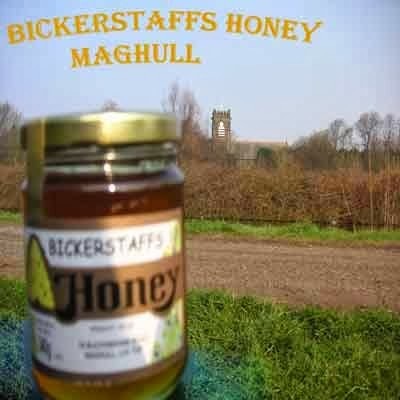 Bickerstaffs only guarantee a live mated Queen Bee. If it arrives dead it must be immediately posted back. Payment can be sent by cheque or on request with PayPal or Bank Transfer . An E Mail payment request invoice is sent which directs purchasers of Queen bees- Cage-Vaporizer-Nucs- CD & DVDs to the site which accepts online transactions in many forms.You do not have to be a PayPal member . If special guaranteed next day delivery is required for Queens , then £6.54 should be added to the cost. An E Mail with the tracker number can be sent. On request a PayPal payment e mail for between 1 to 2 queen bees can be sent (£1.00 per queen charge ), to allow on line payment. Larger numbers of queen bees requires cheque payment to avoid PayPal charges or, on request, Bank Transfer ( Act No and Sort Code will be sent to you) so saving on PayPal charges . Queen bees will only be posted once payment has been received. On submission it will automatically confirm the order has been sent. A further confirmation of your order will also be sent within 24 hrs. Alternative simply send an E Mail with your details. your own YOUNG NURSE bees(tending open brood)to care for the queen. if possible.If no honey is coming in...feed. the hive to a shady spot and keep bees confined for a week during introduction. 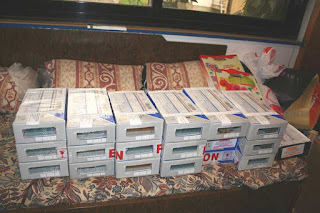 Varroa, Acarine & Nosema are endemic - control. spray on the bees (rather than smoke) taking care she is not balled. If all is well leave the bees alone until the queen is surrounded by her own progeny. Disturbing too soon after introduction can leave to balling of the queen or supersedure. indicate available Queens, or use the phone,post or order form link on the left hand side. instructions ,required dates,numbers and race of Queens . An information pack can be sent on request. Six titles are currently available to purchase on CDs or as a free download. 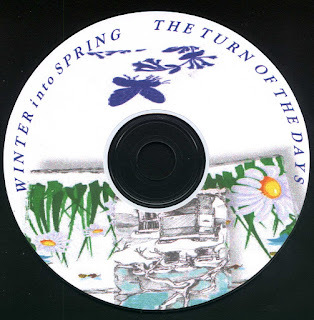 *Click on the WINTER INTO SPRING above to download a free copy as a zipped file . Once unzipped either copy all files and folders to the root of a CD ROM(ie. do not burn the files & folders inside a folder-this will then allow autorun) or leave on hard drive and double click on the- Cp icon-Winter into Spring- to launch it.This multimedia title unlike the others uses your browser settings for navigation so do not block if firewalled. 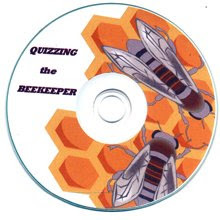 * Same for the QUIZZING the BEEKEEPER - if running from hard drive double click on the QUIZZING icon.If burnt to a CD be patient for two minutes while it loads when running from a CD ROM. To speed navigation-use toolbar to browse at `fit to page` and only `fit width` to read bee books. ADOBE READER can also be used by navigating to the pdf folder. This is hosted on GOOGLE DRIVE. 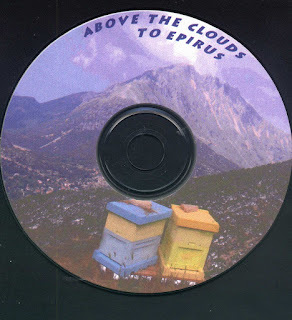 *Same for the ABOVE THE CLOUDS TO EPIRUS -double click on the BICKERSTAFFES2 icon if running from the hard drive. *Same for THE EVER PRESENT PAST- double click on The Ever Present Past icon if running from the hard drive. 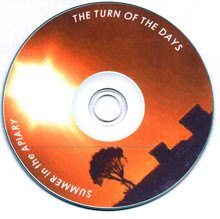 *Same for One Summer Dream -double click on the SUMMER THE TURN OF THE DAYS icon if running from the hard drive. 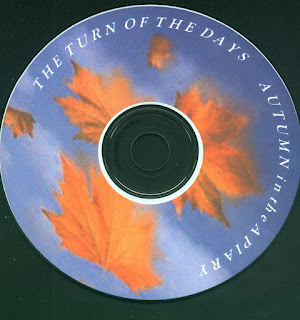 *Same for AUTUMN IN THE APIARY -double click on the AUTUMN in the APIARY icon if running from the hard drive. All best viwed at 800x600 and patience while loading. The discs cover such topics as queen introduction - the late flow - epirus & the greek breeding centre - seasonal tasks - varroa - foul brood - acarine -bee quiz - and more. Playable on a PC. QUIZZING the Beekeeper includes - nine bee books - Break Even Analysis videos & calculator for beekeepers - 240 interactive beekeeping questions. A sample quiz of 30 questions on the Queen bee can be downloaded . 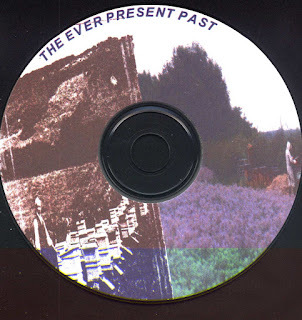 Simply click on the cd cover below and then on the download button. You will need the free Adobe Flash Player 8 or later to play it. You will need the free Adobe Reader to view them. The introduction of queens to alien colonies is the most difficult and uncertain of all beekeeping operations. No method is 100% and as a result a free book devoted to the subject is available as a download. Keep a hand supporting the cage until it is wedged in between the frames. frame, try to avoid including eggs or larvae. If you do not have an introduction cage the Queen cage that she arrives in can be used. for queen cells when returning in a week and knock out if found. day this resource can form the basis of a nuc. with fingers to release her.Re cage and allow her to recover. hive ,place the nuc frames together in the new hive. Please post your COMMENTS on what you have found to be successful in introducing a queen bee, to help other beekeepers. the best known method to do the job. The principle is a short passageway, fitted with a piece of queen excluder and a very small amount of candy (1 CM candy)which is eaten out by the bees after 2 -3 hours, the excluder preventing the queen escaping.The bees feed and care for the queen and after 6 or less hours the longer tunnel(1.5 CM candy) is cleared out and she can join the general community in a calmer state before they have the instinctive urge to replace her. to fall onto the floor on release. urge to replace her by rearing another. cage on a frame of sealed brood. The cage is really designed to be used with frames of brood. If a hive is queenless and broodless then the tunnel without queen excluder should be widened to allow an extension tube of 1 inch to be added and the whole filled with candy.This will delay the release of the queen for a few days. In all cases it is best to not go back into the hive for a few weeks or months until the queen has settled in and laying well.Observation at the hive entrance with pollen pouring in should show success. The danger of balling the queen is always present during this time and leaving the cage will just mean having to cut away some wild comb later on.If you do want to remove the cage, wait a week, and remove in the evening without using smoke. 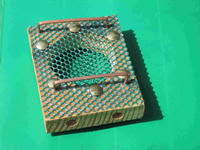 lightly sugared water rather than smoke.Remove the cage and any brace comb. R.O.B Manleys book"HONEY FARMING"pages 200-207 describe this cage and the great success it brings to the most difficult and uncertain of all beekeeping operations. Please post your COMMENTS on any advise you can give a beekeeper on using the cage. The BICKERSTAFFE cage is available World wide. returned for payment by PAYPAL or CARD. The Oxalic acid Vaporizer is heated with a gas/paraffin torch for approximately 5 to 6 minutes causing the sublimation of 2-3 gram oxalic acid crystals.It is important to keep the elbow still and slightly lower than the outlet tube at all times,until it is removed from the hive. This prevents the acid running out as a liquid before it has had time to be heated and sublimate into the hive as a vapour.Apply the heat close to the elbow where the liquid will be and along the entire length for several minutes.Once fumes are first seen(usually vapour is seen from any cracks close to the pipe end).continually run the torch along the entire length of the tube to re liquefy any crystals that stick inside the pipe.If crystals are seen at the tip end when removing the pipe, apply heat there and quickly return it into the hive, all the while keeping it tilted back. It is then left in place for a further minute or two while the vapours settle. 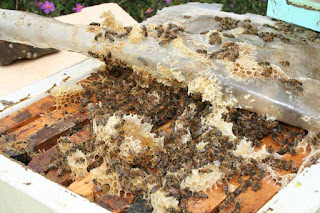 Once removed the hive is left closed up for 10 minutes.Use a metal rod to check the pipe does not become blocked with any acid condensing in the tube,and apply heat to any blockage.Short length pipes of six inches work best. To treat several hives, do not unscrew the cap, instead put the crystals in at the tip end, allowing them to fall to the back. Constantly heat along the entire length of the tube, keeping it slightly tilted back. Once sublimated, with the funnel, refill and move to the next hive. Each hive will then take less than five minutes to treat. oxalic acid is active and corrodes the mites proboscis. The mites die of starvation. solid to liquid to gas) This is why it is important to not allow the liquid to run out of the tube until it has had time to turn into a vapour. Colonies are always healthier in the Spring after treating with the acid. As all parts of the hive are treated it acts as a hive disinfectant and will kill any Acarine .If the beekeeper does not want to use a blow torch, other methods can be devised, such as the use of a tea light to heat the oxalic acid inside the hive. This will work just as well but takes longer and should be left for a few hours after lighting. Oxalic acid can cause damage to health if swallowed and protective equipment should be worn.As the Vaporizer can reach a high temperature gloves must be used and no parts of the metal should be touched. 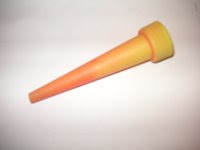 A nozzle is included which can be used as a funnel for adding the crystals.If any crystals fall around the cap and thread it should be wiped clean before heating to prevent the thread seizing.The nozzle can also be placed at the outlet when used with small entrances, nucs or polyurethane hives.Use a flexible wire to keep the tube clear and oil around the cap. As well as from applying from below, an eke can be placed over the brood, with a hole drilled in the side to place the nozzle from above. If a glass or perspex crown board is available the beekeeper can see the sublimation.Using a face mask,goggles and gloves the tube can be heated in the open air to gauge how long it takes to sublimate and to find the correct technique of applying the heat to ensure all the acid vaporizes .Remember it must be tilted slightly back and kept still. The tube is only made long to allow a hand hold, experimentation will allow it to be cut to as little as six inches in length, when mole grips or such like appliances should be used. Best and easiest results are obtained when an eke ( empty super and glass/perspex crown board ) is used with a drilled hole, so avoiding having to hold the tube. * No residues in wax or honey * No resistance formed * Easy to use * Economical * All bees get covered * Gentler than dribbling methods * Can be used several times in a season * No queen losses *Swarms & broodless treated anytime Vaporizer lifelong use * 100g Oxalic acid included with the vaporizer. Vaporizing is gentler on the bees than dribbling, the hive is not opened and all the bees and hive parts get covered,including the mites hiding under the abdominal segments. A short slide show and research article on the use of oxalic vaporization on over 1500 colonies can be found here. 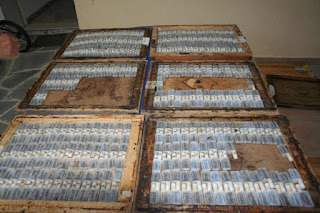 4 slides together with an 11 page scientific article of the testing on 1500 hives. HANDLE OXALIC ACID SAFELY. Keep out of reach of children. Wear goggles,gloves and a protective face mask FFP3.In case of eye contact, immediately wash out with water. Sublimation should see all the vapours staying in the hive, with all cracks sealed, but a face mask must be used as a precaution. For beekeepers who trickle the acid in a liquid form an online calculator is available here to ensure accurate measurement's of ingredients, as the wrong concentration's dribbled can prove fatal, killing many bees or the complete colony. To use the calculator, key in one figure only into the chosen box and then click on CALCULATE. To carry out a new calculation click on the RESET button. 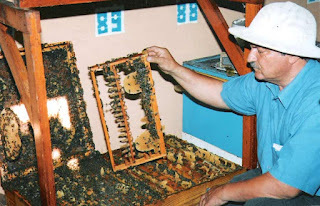 The centre of apiculture was started in 1985 by Margarita and her husband. It was her husband who had a great love for the bees. In the beginning of 1983 just outside Ioannina , a city in the north west side of Greece, they started to build the first establishments. 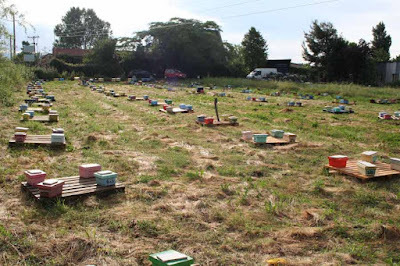 The first years were rather difficult and 5 years passed before the European beekeepers began to know more about the company. Today it is a family concern keeping Margaritas daughter Lambrini busy, who is an agriculturist and her husband Panagiotis who is a beekeeper, Margaritas two sons— Jim & Zacharias ,agriculturists and of course her husband John who is a technician teacher of beekeepers. composed of pollinators and of nectar plants.The abundant pollinators are Salix, Ulex Prunus spinoza, Asphodelus albus and Erica which yields nectar too. 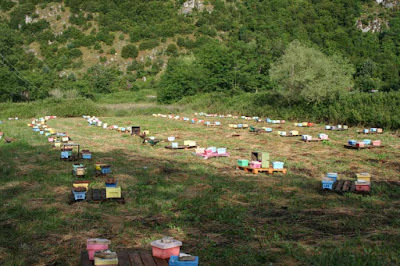 The majority of the beehives over winter in a place south of Ioannina , called Arta, where the temperature is higher and bees can find Erica and Arbutus bush flowers and late orange flowers. In that place at the beginning of March queen breeding starts. traditional basket hives and 2000 mating nucleus made of Styroper. Both natural mating and instrumental insemination is used in the breeding program. confined to these special queen mating stations. and use in his breeding programme of the Cecropian bee.The result over many years of experiment led to his own named bee. * Un mated*Tested mated*Artificial Inseminated*Natural mated on an Island*Breeder Queens- The best suitable for breeding. abundant thoracial and sparse abdominal hair which is brown, and overall dark coloration. Works early in the morning.Can be more runny on the comb and balling the queen. cold weather. The breeding of brood starts early in the spring. Use excessive propolis. Not inclined to rob. One of the best bees for good wintering. Defensive against invaders ie. wasps. Low tendency to swarm. Careful, maritime brood cycle. Strong drive to collect pollen. High longevity of the worker bees and queen. bees. 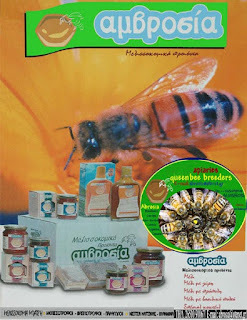 Pack brood nest with honey for good wintering. Curtail egg laying during dearths. than Italian bees, but selective breeding can reduce this tendency. noteworthy for the length of its proboscis, being the longest of all the mellifera races. combines very well with other races, particularly Carnica and Ligustica. drones are dark. The breeding of brood starts early in the spring and makes big colonies. that Macedonica is gentler as it is one of the nearest relatives of the Carniolan bees.The Cecropia is ideal for use in breeding, passing on high fecundity without bad temper. for commercial honey producers. She does not use a lot of propolis. changed to raise different races of bees. To keep track of hives and queen bees good records are essential. A free beekeeping software program and tutorials can be found by clicking the picture. Are you breeding the honey bee on a genetic basis? Or interested in seeing the different traits of the races of honey bees in your apiary. Several races of queens are now available within the UK from BICKERSTAFFS. 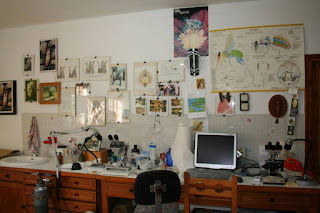 The next post lists them all, together with the traits of her progeny.Study it with care. 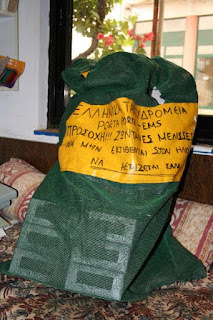 Beekeepers often look for different characteristics and the Greek queen breeding centre has described them for you. All queen bees are mated in the region of Epirus at the north west corner of Greece. 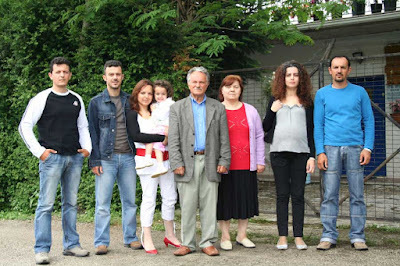 wife Margarita, their two sons Jim and Zacharias, daughter Labrini and husband Panagiotis. early mornings Tuesday from Athens airport which usually arrive Tuesday evening in the UK. Saturday.Because of unpredictable events it is best to track ordered queens from the QUEEN TRACKING page. bred with drones from an unknown source the results can be variable. help provide stronger stocks for when a honey flow may occur. this is then shaken and kneaded into the candy. Wrap in foil . overnight and then introduce your new queen using the Bickerstaff cage. oil to the sprayer to help knock out some Varroa mites, but do not rely on it alone! Help control against Nosema by adding 1 Teaspoon of Tea Tree Oil per gallon of syrup. still give two seasons productivity.